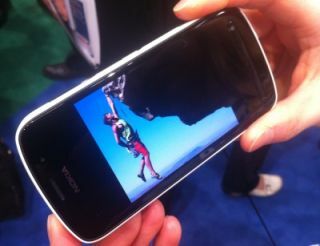 Nokia 808 PureView and Lumia 900 in pictures | What Hi-Fi? Nokia made two key announcements at World Mobile Congress 2012, the launch of the new 808 PureView and the news that the Lumia 900, initially US-only, is heading to Europe. The 808 PureView uses the Symbian operating system, sports a staggering 41 MP sensor camera, has an HDMI output, and has Dolby Headphone specification allowing for Dolby Surround Sound with standard stereo headphones. A wide range of camera options, powerful zoom and one-button picture option combine for Nokia to make it "the next breakthrough for photography", according to Nokia. Due out in Q2, you can read more about the new smartphone in our Nokia 808 PureView news story. Also new for Europe, but already on sale in the US, is the company's flagship Windows Mobile smartphone, the Nokia Lumia 900, the bigger brother to the Lumia 800. The phone has a 4.3in AMOLED screen, 8 MP camera, Windows Phone 7.5, Xbox Live Hub, ESPN Sports Hub and more.